“Concluding the all-new, official trilogy set in the Alien Universe! A new adventure featuring the Colonial Marines and leading directly into the second movie, Aliens. Alien – River of the Pain is the third and final novel in Titan’s new series of Alien novels. Written by Christopher Golden, River of Pain is both very different to its two predecessor novels but also quite the same in many regards. You might be thinking what the hell I’m talking about but I’ll get to that later. Unlike Alien – Out of the Shadows and Alien – Sea of Sorrows, River of Pain takes places not on LV-178/New Galveston but on LV-426. In fact, in terms of narrative, the only connection River of Pain shares with the other books is that Ripley is featured in small segments of the novel. Her appearances are all taken from Aliens and reads as adaptations of scenes from the film. But these are short segments and not very frequent and used to bridge the conclusion of the novel directly into the film. Some of the sections from the Special Edition cut of the movie also feature some small changes from the dialogue film. I can’t see any particular reason why they were changed and it’s not a massive problem. However, when you consider that many of the readers will be intimately familiar with the film, the differences do standout. I’m not sure why Christopher opted to change them but it does make it seem a little lazy to those that know the dialogue off-hand. The book is about how Hadley’s Hope fell and as such that is where the bulk of the novel takes place. This topic has been approached once before by Dark Horse in a small 2 part series written by Mike Richardson, called Newt’s Tale. In fact, Chris Golden takes many elements from Richardson’s previous attempt at telling the story of the infestation of Hadley’s Hope: the birthing of Tim Russell is near identical, the character of Aaron is similar, the name Draper and the scene in which Anne Jordan dies is very similar to Newt’s Tale. I was actually surprised by this as I hadn’t expected to see any connections to the other entries in the Expanded Universe. Golden also snuck in a small nod to the earlier script treatment and Alan Dean Foster’s novelization in the way of multiple atmospheric processors. This really put a smile on my face. River of Pain also ties in to the recent Dark Horse series, Fire and Stone, albeit in a very small manner. Derrick Russell is featured very briefly, as is Genevieve Dione. The Onager was also mentioned. Their roles in the book aren’t very substantial but served as a nice reminder of this over-arcing continuity that Fox seems quite keen on. The first half of the novel is quite a slow burn, taking its time to let us get to know the situation these characters are in. Christopher Golden really emphasizes the mental turmoil that the colonists face every day. It makes a nice change as none of the other novels or comics that I can remember make a big deal of the hardships that are faced when these people uproot their life and attempt to make a new start on a frontier colony. A section relatively early on in the book focuses on the more drastic aspects of this hardship in what can happen when someone really goes off the deep end. It really emphasized what can happen when it all goes truly wrong. River of Pain focuses mainly on the Jordan family – quite obviously as Newt is the sole survivor in Aliens and as her parents are vital to the story in that they bring the xenomorphs back to the colony – and Golden uses their family to further emphasize the hardships of the frontier-life. Russ, Newt’s father, is becoming quite disillusioned with the life he has chosen and it is putting strain on his relationship with Anne. A relationship that is further strained with the introduction of the new Colonial Marine CO, Demian Brackett. Brackett is another fantastic character. He came across as very strong and deep and his connection with Anne Jordan was explored in a very meaningful and mature manner. In fact, Christopher Golden made all of his main marine characters quite distinctive and they didn’t come across as carbon copies of the characters from Aliens which was something that was really appreciated. The inclusion of Colonial Marines was one of the things I was worried about when it came to River of Pain. Christopher Golden handles it a very logical way and it makes perfect sense. Hadley’s Hope is a joint project between Weyland-Yutani, the United States government and the Interstellar Commerce Administration and the Colonial Marines are there on behalf of the government to protect their interests. In fact, Christopher Golden goes into the politics and tensions between the marines and the Company in a way that addresses the misconception most fans have about the Company owning the Colonial Marines. With the introduction of Captain Brackett, the new Commanding Officer of the marine contingent on Acheron, the status quo on the colony is shaken up as Brackett doesn’t hide the fact he doesn’t approve of the way Weyland-Yutani are of the opinion they can use the marines for whatever they please. I was really pleased to see this handled in such a mature and logical fashion. 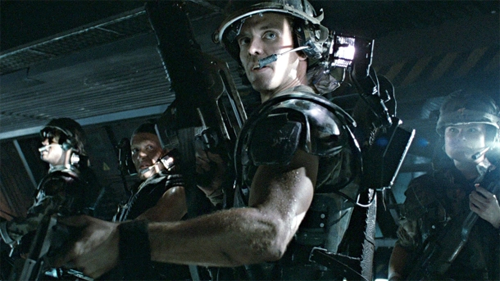 However, while Christopher Golden convinced me why Colonial Marines should be attached Acheron, it doesn’t get around the fact that without some sort of George Lucas re-edit of Aliens, the lack of any mention of any missing Colonial Marines by the squad in Aliens makes their inclusion stand out like a sore thumb. Not to mention why Hicks and company didn’t go looking for whatever stockpile of weaponry the local contingent had in storage after the dropship is destroyed and the film makes it abundantly clear that they are low on ammo. Dark Horse tried to address it with their short comic, Field Report, in Dark Horse Presents but I imagine this will be something that will continue to grate on fans of the series. I wasn’t able to look past the inclusion of the Colonial Marines. River of Pain also includes some history behind the reasons behind LV-426 being colonized. Golden goes onto talk about how Weyland-Yutani became involved because of the Nostromo Incident, as the ships disappearance would come to be known as. They suspected that something was on the planetoid but had no idea what or where. I really enjoyed this as it made sense and was a nice contrast to the often sprouted “the Company knew about the aliens all along” theory. We are also treated to some minor exploration of the Derelict by Anne and Russell Jordan which was something I had been looking forward to. We see more of the original Derelict crew, locked in their death throes with their Alien cargo. Some Prometheus influence starts to shine through here so for those of you out there who aren’t interested in the changes Prometheus made to the mythology – humanoid in a biosuit – you can rest easily knowing that this is only a tiny part. That said, a huge continuity error screams out of the pages during this section. For some reason Christopher Golden had the eggs in the Pilot Chamber. It was a glaring error and combined with the dialogue changes I mentioned earlier, it does make it seem like Christopher might have needed to have gone back and re-watched Alien and Aliens one more time before handing the manuscript in. I discussed the inclusion of the previously unmentioned presence of Colonial Marines but that isn’t the only piece of retcon (or revisionist history, depending on how you like to look at it) that River of Pain treats us to. Like Out of the Shadows and Sea of Sorrows before it, River of Pain also sets up potential avenues for sequels and this is where another of River of Pain’s retcon comes in as Golden has a small number of survivors escape Hadley’s Hope (as well as the group on the Onager in Dark Horse’s Aliens: Fire and Stone). Spoilers: Captain Brackett is able to escape Hadley’s Hope with one of the Weyland-Yutani scientists, a fellow officer and a small girl, Luisa. This is where I feel the ending fell down as the novel had put particular emphasize on how important it was for Brackett to save Newt and instead, just pages before the end of the novel, he takes Luisa instead. It completely lacked the emotional resonance that Newt’s rescue would have created and left the conclusion a little empty. In fact, the whole set-up at the end of the novel seemed designed to replicate the original Wilks and Billie (or Hicks and Newt depending on which version you’re reading) comics but it falls short. This was a real shame as Chris Golden had really made his characters shine through the first half of the novel. He did such a fantastic job crafting the characters that occupied the world. As well as the ending not having as much impact as it could have been, the second half of the novel did start to falter but not through anything drastic. The characters all jump to perfect conclusions regarding the Aliens – for example, Brackett knows that the missing colonists are being cocooned somewhere to play host to some lovely face-huggers. Another is when Ripley immediately sums up Burke as soon as she meets him. I saw it best described as if the characters had seen the film that would come after the book. Other small things such as the colonists knowing what happened after being face-hugged but doing nothing to quarantine the infected were disappointing. And of course, everyone forgetting about the PDTs – Personal Data Transmitters – when the local marines are searching for the missing colonists. In Aliens the PDTs were used to locate the colonists almost immediately after the Colonial Marines had established camp. These PDTs are completely forgotten until Captain Brackett pretty much goes “duh! We forgot about the PDTs!” It was a really disappointing moment. 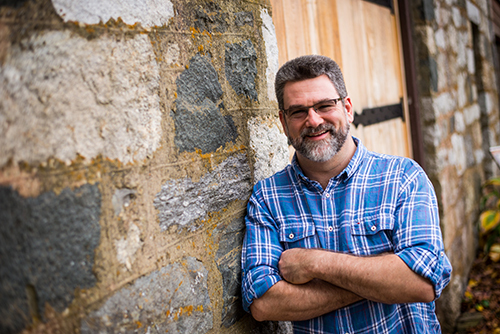 Christopher Golden, the author of Alien – River of Pain. I thought River of Pain did a very good job of keeping the Aliens threatening, even though Golden gave the characters access to weaponry we didn’t know they had. Whilst they were able to kill a small number of the Aliens, they were largely stealthy and capable of picking the right moments to make their presence known. He used their acid to deadly effect, taking down many characters with the splash. It’s always nice to see the Aliens retain their dangerous nature. The main bulk of the novel takes place over the course of a month, with the main incident taking a single day. It was really cool to see how fast the Alien infestation happened and played out as quickly as I would have imagined. I would have liked to see have seen more of Newt’s survival after the colony fell, especially given how Alien Isolation has brought the survival and terror aspect of the franchise back to the forefront. It would have been really interesting to see more of what Newt had to endure. Christopher Golden had already shown he liked to play with the psyche of his characters when put under such horrible strain so I feel he would have had a fantastic handle on those sections. Over all I really enjoyed Alien – River of Pain. I thought Christopher Golden’s characters were wonderfully written and his development of the colony and the frontier life was amazing. His handle on the characters was fantastic, particularly Captain Brackett and as were his portrayals of the Jordan family. My biggest issue was that I just wasn’t able to look past the inclusion of the Colonial Marines, no matter how logical their inclusion. Whilst the second half of the novel did falter slightly, it was still a really good read and I’d recommend giving River of Pain a read as it is another strong entry in Titan’s line of Alien novels. From Aaron Percival here at AvPGalaxy, I award Christopher Golden’s Alien – River of Pain with a 7 out of 10. Despite the plot halls and errors this book is a great build up to Aliens movie. I had reservations about Marines being stationed there but I think the story would have been much shorter and duller without them, personally I just assume that Hick’s and Co were not informed of a marine presence on briefing. I do hope to see Breckett and the survivors in another story. Oh that’s very interesting about FOX mandating the inclusion of the Marines. I have to say I agree 100% about the Colonial Marshal Bureau from Isolation, that was very well handled in that game and made perfect sense. I’ll probably get the book over the weekend and give it a read, I have always been incredibly interested in the story of Hadley’s Hope. I think a story like that would be great to see on the small screen handled in a way like a mini series. Dark and serious like Walking Dead and Battlestar sorta thing. One can dream, lol. Alien Isolation has actually introduced this idea of Colonial Police through the Colonial Marshal Bureau. I would have loved to have seen them included instead. It’s a very good idea and logical inclusion to the franchise. Don’t get me wrong, like I said, I thought Chris did a fantastic job in his handling of the Colonial Marines. All his reasoning made sense. The characters were great. It’s just too noticeable that they were never mentioned in the film. At least, in my opinion. On the contrary, the inclusion of the Marines is extremely well executed and flows into the overall story quite well. They’re not presented in the style of the marines in Aliens, they’re more there as ‘police’ to keep the peace . I’d often wondered if there was some sort of law enforcement or protection for the colony (seeing as it was a distant colony where anything could happen). It was actually a sensible way of explaining that. I’d love to see it adapted into a film. Over all, it was still a very good book. The inclusion of the marines was mandated by Fox. Christopher did a great job telling me why they were there. The fanboy inside me just couldn’t get over it. The Derelict thing was a genuine mistake, as annoying was it was. I’d still recommend the book – it doesn’t really ruin the book. Just some annoyances. Nice review, thanks for going into such detail! I have to ad my 2 cents that I hate that book cover, it is so generic and just plain bad. So it the title of the book, it should have been called, “Aliens: Hadley’s Hope”. As for the issues you mention those are some pretty big ones to me. I have not read the book myself, but just thinking about the inclusion of the marines you mention sounds terrible! And how do you forget about the location of the eggs in the derelict, the PDTs in the colonists? Those are no brainers and of course any fan is going to be bothered by that. I’d still like to read this one day, as the story of Hadley’s Hope has always interested me. I’ve always imagined a worst case scenario Walking Dead style situation happening there, where people are trying to survive by any means necessary with hardly any weapons etc etc. Now that I know about the stupid stuff, pointed out in your review, I can hopefully enjoy this book without getting frustrated. But seriously, if they were looking to reboot the film series, then they have a great story to adapt right here with this book. Whilst reading it, I thought exploring the Aliens behaviour building their ‘hive’ would be a very interesting perspective for a new film. True, they might not have had much – but given how desperate they were, it’d make sense for them to at least check for a clip or two. I don’t think Hicks and Co. not looking for the previous Colonial Marines’ ammo stash takes away from this story to be fair … Really, they were stationed there as ‘Police’ to keep the peace, so it’s not too much of a stretch to think that they didn’t bring much with them in terms of weaponry. They may only have had the weapons they were holding for as far as we know.